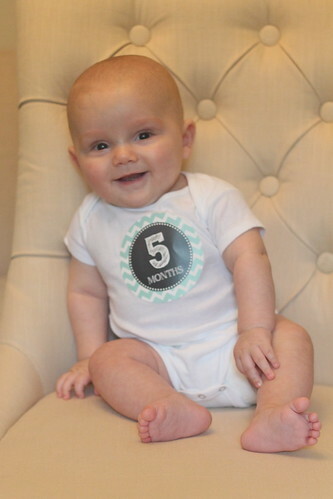 Umm, didn't I just do Connor's four-month photos like... last week? How is time moving so quickly? I'm just in awe of everything right now. In awe of how he's constantly learning and doing new things, in awe of how so much joy and so much perfect could fit into one little boy, in awe of motherhood, and in awe that this is my life. I'm trying to soak up all these little baby moments, but they just go by so quickly! Birth Weight: 6 pounds, 6.5 ounces. Current Weight: 17 pounds, 3 ounces. Birth Length: 19.5 inches. Current Length: 25.75 inches. 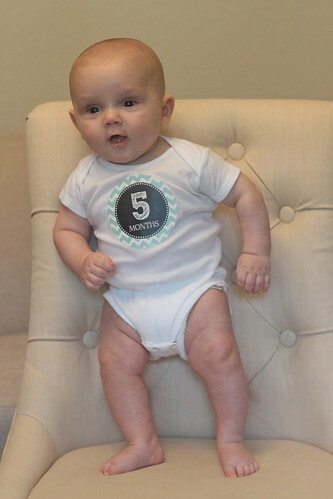 Clothing: Wearing 6-9 month clothes and size 3 diapers! Putting things in his mouth. Being tossed in the air or swung around. Waiting in between bites of rice cereal for Mommy to reload the spoon. The noise the fridge ice dispenser makes. Sitting unassisted for about a minute. Reaching out and grabbing things. Taking steps if you hold his hands (and trying to even if you don't!). Eating rice cereal from a spoon. 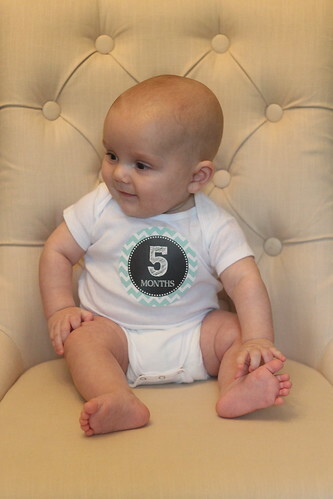 Happy five months, little one!